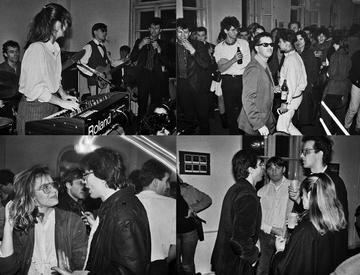 In December 2009, Belgrade's Skc (Student Cultural Centre) organised the exhibition "Three Decades of Novi Talas (New Wave)", to be exhibited in several Serbian towns. Through original pictures, posters, and footage, the exhibition explores one of the liveliest and most creative phenomena of the Yugoslav cultural scene of the '80's. Dragica Vukadinović is the curator of the exhibition and of Skc's archive and library. What was the Novi Val (New Wave) phenomenon in the former Yugoslavia? I can talk about Novi Val in Belgrade, and namely at Skc (Student Cultural Centre) because I worked there. To me Novi Val, starting between the late '70's and the early '80's, represents a new generation breaking onto the scene and a new, very creative cultural milieu. It was about young music and art consumers finally understanding they can live like young people in other countries, understanding that many things have become more accessible, and claiming the right to their own forms of expression. I believe that we – the people working at Skc, an institution that in the '70's was linked to conceptual art - grasped the potential of Novi Val without worrying too much about quality and categories, but instead sticking to the principle that everyone should have a chance to show what they can do. After a while, this potential also emerged through serious musical and art works. As soon as 1978, Koja and Milan Mladenović formed first “Limunovo drvo", then "Šarlo akrobata", and finally "Ekaterina Velika" and "Disciplina Kičme". Then there were "Električni Orgazam" and "Idoli", perhaps the most representative band, and many others. To sum up, Novi Val is meant to characterise the '80's. In some aspects, yes. Music, art, and theatre were no longer for professionals only: a new generation of high-school students was emerging, access to cultural production became more democratic, and it was easier to organise events. For me, Novi Val was more of a social and cultural phenomenon and a way of life than an artistic category. For example, it was clear that punk did not belong in Novi Val, but the two terms were often mixed up. Performances turned into something that today we might call “eventing”. Concerts often turned into sessions and then parties, and these parties were crucial occasions to meet and lay the foundation for the next events. Parties play a crucial role in memories of the time, like Isidora Bjelica's. Those were years of optimism, people believed the situation would continuously improve. Then came the '90's that showed it was not so simple. Young people took things in their hands, formed bands, recorded demos. Key events included the first big Novi Val concert at Skc; that lasted two days with no interruption with bands taking turns on stage and people coming from the province to sign up to play. There was also a contest for rock pictures, with a related TV programme. Almost every band had its fanzine, usually made with typewriters and Xerox. Everything, including cultural products, had become more accessible and living standards had changed. Skc emerged as a big art producer as well as a cult location that witnessed the emergence of key characters on the cultural scene, such as photographer Dragan Papić, cultural animator and film critic Nebojsa Pajkić, and Miomir Grujić, founder of the Akademija club. Unfortunately, little original material remains because nobody thought it would have any value some day. Which influences came from abroad? There were strong relationships with other Yugoslavian cities, especially Zagreb, Ljubljana, Sarajevo, Skopje, Novi Sad, and their student centres. Novi Val youth also developed strong, balanced relationships with the underground environment in Europe – especially in London – and the US. 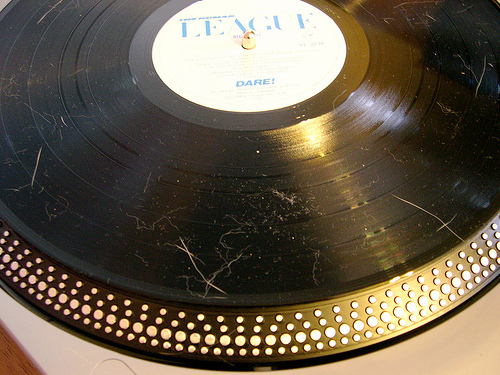 Materials circulated and business could be made by selling cassettes and recordings. Some people travelled, others moved abroad. European bands played at Skc. Relationships also existed in the visual arts, with well developed communication especially with the German and Italian scene. These ties were broken in the '90s with the wars, the cultural embargo in Serbia, and the visa regime. Before that, the Yugoslavian passport was famous for the travelling opportunities it offered. Were there contacts between Novi Val and politics? In the '80s came the first generation that committed to having fun rather than doing politics. The levity of Novi Val was, in a sense, a reaction to the severity of the '70's, and still very much in love with 1968. In Belgrade, the Novi Val phenomenon often involved the offspring of socialist elites who loved art and music as well as parties and glamour; this also explains why authorities reacted more softly than in the '70s. The government started to get the breadth of the phenomenon and use it politically. By 1984/85, the New Wave was already completely accepted and many concerts staged bands that had been unwelcome not long before. What are the Novi Val chronological standpoints? 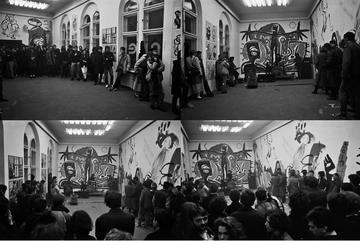 Our exhibition at Skc starts with the 1977 concert of the "art band" Kosmetika at the famous festival "aprilski susreti" (April Meetings) that gathered avant-garde European and international artists. By "art band" I mean a rock band formed by artists with a musical education whose primary vocation was not music. Let's say that music was part of a wider collective phenomenon. At Skc, we chose to take 1989 as the final standpoint. 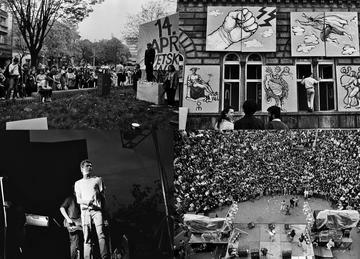 That year, most bands of the time played at a big event and exhibition organized for 25th May, Tito's birthday and "Youth Day", that had received significant financing. That was the last time 25th May was celebrated.